Strolling through my local grocer’s produce section there are bags and bags of fresh, ripe, dark cherries, ready for picking… and pitting. 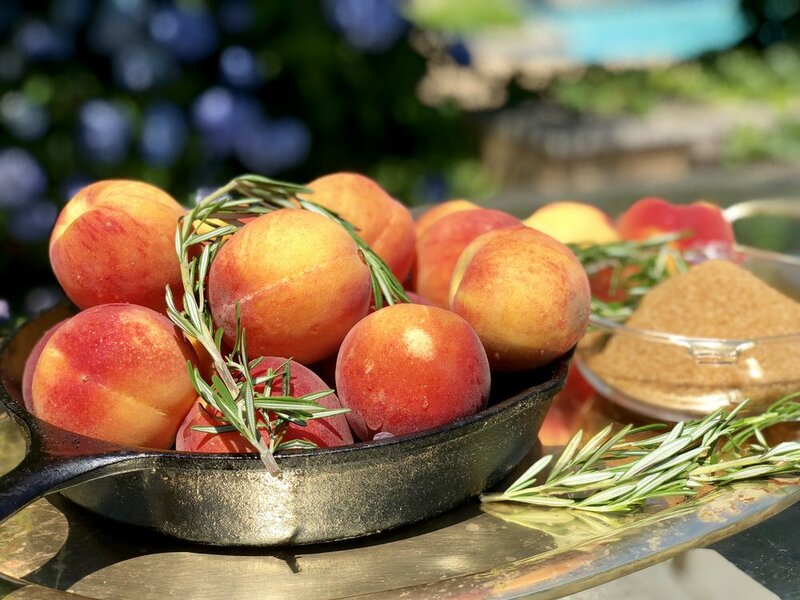 Alongside those fresh stone fruits like plums and apricots, there is one of my favorite summertime gems… Oklahoma peaches! With this bountiful abundance of summer fruits, a classical French dessert came to mind instantly. Let’s make CLAFOUTIS! Clafoutis, pronounced Klah-Foo-Tee, hails from the Limousin region of France, and is traditionally made with fresh “intact” (un-pitted) dark cherries. Why intact? Well, the French in their unwavering and often on point attention to detail when it comes to their food figured out that cooking cherries intact releases an almond-like flavor from the pit… adding an additional “note” to any dish. No worries here, my friends! Although I respect the attention and authenticity of the French, my clafoutis does remove the pit (or stone)… and adds a hint of almond flavoring for that je ne c'est quoi. Also adding fresh sweet Oklahoma peaches and a bit of fresh lemon zest REALLY adds a whole other layer of flavor. Enjoy the Clafoutis and helllllooooo summer! To remove the skin from peaches, "X" the top with a paring knife, place in a pot of water and bring to simmer. Remove from the heat and let stand for 10 minutes. Shock in ice water and peel the skin from the peaches. pouring the custard over the sliced fruit. I halved the cherries for this photo only because I did not have my trusty cherry pitter tool... otherwise they would have remained whole. In a blender combine the eggs, milk, sugar, lemon zest, salt, vanilla and almond extracts. Blend until smooth. Gradually sprinkle in the flour and pulse after each addition. Add in the melted butter and run the blender slowly until a nice custard batter produces. Place the lid on your blender and let it rest on the counter for at least one hour or in the refrigerator overnight. If placed in the refrigerator overnight remove it to “warm up[“ on the counter at least one hour before baking. Butter and flour the inside of an 8” or 9” round baking dish.. you may also use a small rectangular or square baking dish. Lay down the slices of fresh peaches in the bottom of the dish, followed with the whole (or halved) stoned cherries. Pour the custard over your fruit and gently tap the bottom of the dish on your counter to release any trapped air bubbles. Place the dish in 350-degree preheated oven and bake approximately 45 minutes or until your clafoutis is set in the middle. Remove the clafoutis from your oven to cool. Once cool enough to handle sprinkle the top with toasted sliced almonds and a dusting of powdered sugar. Slice and serve war, to room temp or chilled with a dollop of sweetened whipped cream. Enjoy!